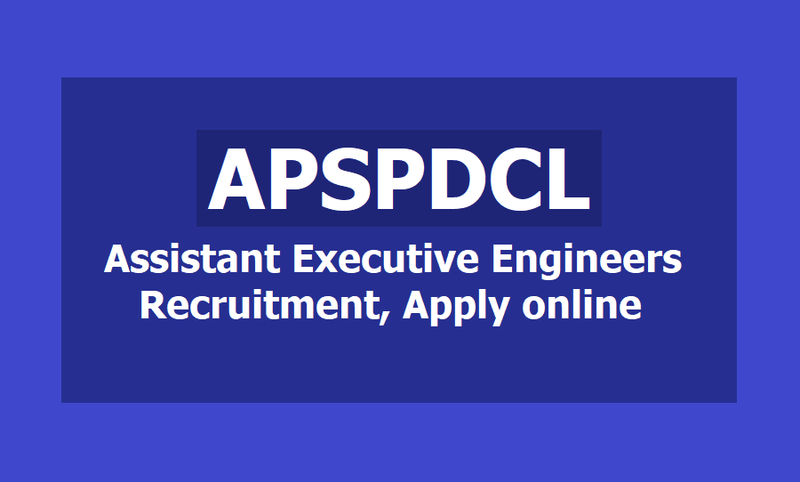 APSPDCL AEE Assistant Executive Engineers recruitment 2019 Apply online: Online application form, last date for apply, hall tickets, results, selection list and more details are available @ http://apspdcl.cgg.gov.in/, APSPDCL has released the AEE Assistant Executive Engineer Posts 2019 Recruitment Notification in February 2019 and Southern Power Distribution Company of Andhra Pradesh (APSPDCL) invites online applications from the eligible and qualified candidates for the post of AEE Assistant Executive Engineers(Electrical). Subsequently, in accordance with the Third Transfer Scheme notified by GO AP, APSPDCL ceased to do power trading and has retained powers of controlling system operations of Power Transmission. Applicants must possess the qualifications from a recognized University as detailed below or equivalent thereto, as specified in the relevant Service Rules of APSPDCL as on the date of Notification. Electrical: Must possess a bachelor degree in Electrical Engineering /Electrical & Electronics Engineering of a University in India established or incorporated by or under a Central Act or Provincial Act, or a State Act or an institution recognized by the University Grants Commission or a pass in Sections ‘A’ &’B’ of AMIE(India) examination in Electrical Engineering. Civil Must possess a bachelor degree in Civil Engineering of a University in India established or incorporated by or under a Central Act or Provincial Act, or a State Act or an institution recognized by the University Grants Commission or a pass in Sections ‘A’ &’B’ of AMIE(India) examination in Civil Engineering. Age Limit: Minimum 18 years and Maximum 42 years. The age is reckoned as on 01/03/2019. As per G.O.O(CGM-HRD-Per) Ms.No.166, dt.02.09.2015, the Upper age limit is raised up to 10 years i.e., from 34 to 42 years. i) Each applicant must pay Rs.150/- (Rupees One hundred and fifty Only) towards Application Processing Fee (Registration fee). ii) Applicants under General category must also pay RS.350/- (Rs.Three hundred and fifty only) towards Examination Fee. (Applicants belonging to SC/ST/BC Communities and PH need not pay this fee ). iii) Candidates belonging to States other than Andhra Pradesh will be considered in general category only and are required to pay the above- prescribed fee. Payment of fee through Payment Gateway (Bill Desk/Atom). Candidates need to visit the payment link on the website and provide basic details like Name, Father/Husband Name, Date of Birth and Community (BC, applicable SC, ST, applicably OC) and whether Physically Handicapped (PH). Based on the details of community and other details, the system will applicable. The candidates have to pay the indicated fee and obtain a receipt with JOURNAL NUMBER printed on it. After Payment of a fee, the applicant has to visit the website http://apspcl.cgg.gov.in and access the online application form. APSPDCL can provide a link to this website on APSPDCL website. The applicant has to provide details of JOURNAL NUMBER given on the payment receipt to access the application form. The candidate has to fill all the relevant details and upload “scanned copy of passport photo with signature below the photo” and submit to the system. ON successful submission system will alert the applicant to download the pdf document containing the details submitted by the applicant with unique application number (Reference ID) as the acknowledgment. Last date for payment of fee: 24.04.2019. Last date for submission of application: 25.04.2019. The written examination for recruitment of AEE Assistant Executive Engineers (Electrical) will be held on .... at 10 AM to 12 Noon.